A crisp T20I series in Florida was perhaps the best way to terminate India's tour to the West. The host team, West Indies, is ranked No. 3 on the ICC T20I rankings. India, on the other hand, is just one place above them at No. 2. When it comes to the paper, West Indies looks way hefty than India. The presence of all-rounders who fancy the shortest format of the game along with their depth in batting is their principal might. One of the reasons for them being the current 'Champions' of the format. The last time West Indies played a T20I was close to five months ago. The current team is somewhat similar to the one that played in the World Cup. However, the focal point will be Carlos Brathwaite. The 28-year old and 8 T20I's experienced all-rounder is the new captain of the team which obviously means that Darren Sammy will no longer lead the side. The fact that he has been handed the axe as a player as well is hard to digest. Indian bowlers will be looking to dismiss Gayle early. The universal boss, Chris Gayle, would be looking to continue his run from the CPL into international cricket as well. Johnson Charles is most likely to partner him at the top of the order. His opening partner from St Lucia Zouks, Andre Charles will bat at No. 3. 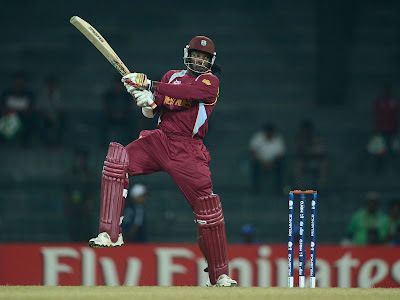 In the absence of Denesh Ramdin, he will also take the responsibility behind the stumps. West Indies' heroes from the semi-final and the final of the World Cup will form the middle order. Yes, Lendl Simmons and Marlon Samuels are the ones I'm talking about. The duo will be followed by DJ Bravo who will be the first of the four all-rounders. Kieron Pollard, Andre Russell and Carlos Brathwaite being the other three. Half the strength of this Caribbean team lies in this foursome. Their savage brawn in both batting and bowling will hold the key against India. Talking of the two specialist bowlers, Sunil Narine and Samuel Badree is the best set of spinners a T20I team would aspire of. The former being a right-arm off-break and the latter being a leg-break bowler. The duo can deceive any batsmen in it's guile. Resultantly, both of them have a T20I economy rate of less than six. Jason Holder and Evin Lewis will warm the bench for the hosts. India will once again rely on their trilogy of Shikhar Dhawan, Rohit Sharma and Virat Kohli at the top of the order. Lokesh Rahul, who was incorporated into the squad on the basis of his performances in the IPL and in Zimbabwe is most likely to bat at No. 4. Ajinkya Rahane will over again bat in the middle order due to the team's cause. The top six of the Indian batting line-up including MS Dhoni look solid but the fact that none of them can bowl the quota of the fifth bowler is in itself something Dhoni and Anil Kumble will have to think about. Lokesh Rahul would be looking to cement his spot in the senior side. Inspired by two well-compiled centuries in the test series, Ravichandran Ashwin is all set to bat at No. 7 in the limited overs squad now. Out of the four fast bowlers in Bhuvneshwar Kumar, Mohammad Shami, Jasprit Bumrah and Umesh Yadav, one is likely to sit out for the first T20I. It can be anyone out of Mohammad Shami or Umesh Yadav. One spot which remains vacant can be filled by anyone out of Ravindra Jadeja, Amit Mishra and Stuart Binny. What the management has to realise is that this spot is more for a fifth bowler than a seventh batsman. In terms of bowling, Jadeja has 29 T20I wickets from 37 matches which have come at an average of 30.75 and an economy rate of 7.04. Mishra has 11 wickets to his name in seven T20Is. His average of 15.46 and an economy rate of 6.46 is more impressive. Binny has a sole wicket in two T20Is, but whether he has it in him to bowl his complete quota of four overs is the bigger question. For me, Amit Mishra should be given a go ahead of Jadeja and Binny. So it will be enthralling to see the proceedings tomorrow. India will be officially playing in the USA for the first time. Not to forget, Carlos Brathwaite will be leading his national side for the first time.